This obituary is a really good read about a man with an amazing career and legendary reputation. I am a Johnny Bench fan - he's my favorite athlete and his home run on Johnny Bench Night is my favorite "in-person" sports moment - and think he was the greatest catcher ever, but, if not him, it may have been Yogi. He was a great player and manager and perhaps the ultimate winner in baseball, with many World Series Championships and pennants. His was truly a remarkable career and here is one more fine article about it. I know that comparing modern day people to Abraham Lincoln or wondering "WWALD" (what would Abraham Lincoln do?) is nothing if not a cliché and I try to avoid resorting to it, but as a baseball fan I will go through with it anyway. I can see possible comparisons between the lives of "Yogi" and "Honest Abe" due to less than ideal childhoods and education and how others thought them physically unattractive or underestimated their intelligence and abilities, but my main curiosity is about the similarities in how they are often remembered for their quotations and, perhaps more frequently, supposed quotes. Which one is quoted (or misquoted) more often? I guess it s the ex-President just due to the length of time since his life, but Yogi has a lot of humorous quotes, a.k.a "Yogi-isms" attributed to him, though, like with Lincoln, many may be apocryphal. What was funnier - Lincoln's stories and jokes or Yogi's malaprops? 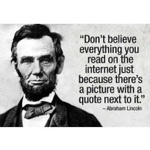 How did such quotes contribute to their images - Lincoln as a story-telling country hick then a wise statesman, the "Great Emancipator" and Yogi as a seeming simpleton, who later became viewed almost as a wise-old baseball philosopher. Is there a lesson in historical memory in these questions or comparisons, or am I completely off-track? 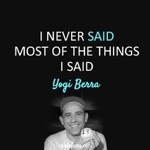 Even in the "modern" world of specific reporting for sports and athletes, as well as recorded interviews, exactly what Yogi may or may not have said is still uncertain. Perhaps, though, that uncertainty just adds to his legend much like Lincoln's repurpose ion for story and joke telling contributes to his reputation. I, of course, cannot compose such a post without some well-known internet memes touching on this subject. That just wouldn't be right.